After being shot three times last month, Montana Highway Patrol Trooper Wade Palmer has regained consciousness and his condition has been upgraded, the Montana Department of Justice said in a statement Tuesday. Palmer was moved from the Neurological Critical Care Unit at the University of Utah Hospital to its Neuro Acute Care Unit. He is scheduled Thursday for reconstructive surgery to repair injuries sustained to his jaw. The Montana Highway Patrol said Palmer’s interactions remain non-verbal, though he now shows recognition of certain people and commands. His condition has been upgraded from critical to stable. Palmer was shot in the neck, face and head after locating the suspect involved in an earlier shooting in Missoula that injured two and killed one. He was transported to St. Patrick Hospital initially and moved to Salt Lake City, where he was in a medically induced coma for several weeks. The incident has sparked widespread public support for the trooper and his family, including the Fraternal Order of Police in Utah. The Missoula Fresh Market has established a “register roundup” and Alpha Graphics has developed special stickers. Several banquets and fundraisers have been held, and a benefit account has been established in Palmer’s name at First Interstate Bank. A full list can be found on the webpage established by the state by following this link. 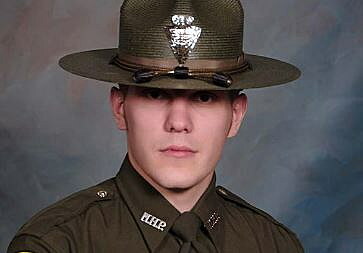 “We are immensely grateful for Trooper Palmer’s progress,” said Col. Tom Butler, chief of the Montana Highway Patrol. “We remain hopeful as we see Wade continue to heal and make positive strides, however, we are fully aware that he has a long journey ahead of him.